Still available! IAC's sturdy laminated versions of the 2017 U.S. child/teen immunization schedule and the 2017 U.S. adult immunization schedule—order a supply for your healthcare setting today! Every year in August, National Immunization Awareness Month (NIAM) provides an opportunity to raise awareness about the importance of immunization and the need for improving national vaccination coverage levels. NIAM is sponsored by the National Public Health Information Coalition (NPHIC). The first week, July 31–August 6, focuses on vaccinations for babies and young children. Vaccines give parents the safe, proven power to protect their children. A healthy start begins with on-time vaccinations. Whether it’s at school, day care, or playing with friends, children are often in close contact with one another, making it easier to spread germs. 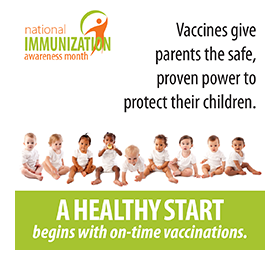 During the first week of August, NIAM will focus on the importance of vaccinating children according to the recommended vaccine schedule. This schedule includes an annual flu vaccine for all children 6 months and older. Annual flu vaccinations for children 6 months and older protect them from flu, which can cause hospitalization or even death. During the 2016–17 flu season, 101 children died from flu-related causes. A recent CDC study published in Pediatrics found that flu vaccination reduced the risk of flu-associated deaths by nearly two-thirds (65%) among healthy children from 2010 through 2014. During the same time period, deaths were reduced by half (51%) among children with underlying high-risk conditions. As we look ahead to the fall, this is a good reminder to encourage parents to get their kids vaccinated against flu. The 2017 edition of the NIAM communications toolkit, put out by NPHIC in collaboration with CDC, contains key messages, vaccine information, sample news releases and articles, sample social media messages, links to web resources from CDC and other organizations, and logos, web banners, posters, and graphics to use with social media. The website also includes a place for you to share your NIAM activities and view what others are doing for NIAM, using the hashtag #NIAM17. Merck is not currently distributing its adult Hepatitis B vaccine and does not expect to be distributing adult Hepatitis B vaccine between now and the end of 2018. Additionally, Merck anticipates that its pediatric Hepatitis B vaccine will be unavailable between early August 2017 and mid-January 2018. Merck’s supply of the dialysis formulation of Hepatitis B vaccine, however, is not affected and is expected to remain available. GSK has sufficient supplies of adult and pediatric Hepatitis B vaccines to address the anticipated gap in Merck’s supply of adult and pediatric Hepatitis B vaccines during these time periods; however, preferences for a specific presentation (i.e., vial versus syringe) may not be met consistently during this time. The Yemeni crisis requires an unprecedented response. Our 3 agencies have teamed up with the Yemeni authorities and other partners to coordinate our activities in new ways of working to save lives and to prepare for future emergencies. The HPV Vaccine is Cancer Prevention Champion Award is a new annual award given jointly by CDC, the American Cancer Society, and the Association of American Cancer Institutes. The award is intended to recognize healthcare professionals, clinics, practices, groups, and health systems that are effectively working to protect adolescents against human papillomavirus (HPV) cancers by achieving high HPV vaccination rates among 11- and 12-year-old patients. Each year, up to one champion from each of the 10 U.S. Department of Health and Human Services regions will be selected and recognized. The first award recipients will be announced in the fall of 2017, featured on the CDC website, receive an HPV Vaccine Is Cancer Prevention Champion plaque, and may be recognized at local or national events led by cancer or pediatric organizations. Access information about award criteria. Click on the image below to access the nomination packet. CDC published Update: Temporary Total Depletion of U.S. Licensed Yellow Fever Vaccine for Civilian Travelers Addressed by Investigational New Drug Use of Imported Stamaril Vaccine in the July 28 issue of MMWR (page 780). The complete article is reprinted below. Sanofi Pasteur, the manufacturer of the only yellow fever vaccine (YF-VAX) licensed in the United States, has announced that their stock of YF-VAX is totally depleted as of July 24, 2017. YF-VAX for civilian use will be unavailable for ordering from Sanofi Pasteur until mid-2018, when their new manufacturing facility is expected to be completed. However, YF-VAX might be available at some clinics for several months, until remaining supplies at those sites are exhausted. In anticipation of this temporary total depletion, in 2016, Sanofi Pasteur submitted an expanded access investigational new drug application to the Food and Drug Administration to allow for importation and use of Stamaril. The Food and Drug Administration accepted Sanofi Pasteur’s application in October 2016. Manufactured by Sanofi Pasteur in France, Stamaril is not licensed in the United States, but is licensed and distributed in approximately 70 countries, and has comparable efficacy and safety to YF-VAX. During the interim period until YF-VAX is available again for use in the United States, Stamaril will be available in a limited number of designated clinics, selected to provide access to vaccine in U.S. states and certain territories. Clinicians and travelers can find clinics offering Stamaril vaccine and those clinics that might have remaining doses of YF-VAX online at https://wwwnc.cdc.gov/travel/yellow-fever-vaccination-clinics/search. Consideration will be given to adding more clinics if critical gaps in vaccine access are identified. CDC and Sanofi Pasteur continue to collaborate on contingency planning to address this situation. Information about which countries require yellow fever vaccination for entry and for which countries CDC recommends yellow fever vaccination is available at https://wwwnc.cdc.gov/travel. Updates regarding yellow fever vaccine will be available on CDC’s Travelers’ Health website (https://wwwnc.cdc.gov/travel) as well as Sanofi Pasteur’s website (http://www.sanofipasteur.us/vaccines/yellowfevervaccine). On July 10, the Association of State and Territorial Dental Directors (ASTDD) published a white paper on human papillomavirus and oropharyngeal cancer in which they endorsed promotion of the HPV vaccine to reduce the risk of HPV-related oropharyngeal cancer. State oral health programs (SOHPs) can play a critical role in facilitating evidence-based state and community practice interventions and messaging campaigns aimed at effectively promoting the HPV vaccine. Through external and internal partners, SOHPs can help develop collaborative partnerships and referral networks that can empower an interprofessional workforce of dental and medical practitioners to promote use of the HPV vaccine for their patients and increase the rates of completion of the HPV vaccination series. In addition, ASTDD recommended incorporating HPV-related oropharyngeal cancer awareness strategies into oral health promotion efforts and healthcare professional academic curricula. The ASTDD white paper is available to download at www.astdd.org; scroll to Human Papilloma Virus (HPV) and Oropharyngeal Cancer (July 2017). The Association of State and Territorial Dental Directors is a national nonprofit organization that represents the directors and staff of state public health agency programs for oral health. There are 633 organizations now enrolled in IAC's Influenza Vaccination Honor Roll. The honor roll recognizes hospitals, medical practices, professional organizations, health departments, and government entities that have taken a stand for patient safety by implementing mandatory influenza vaccination policies for healthcare personnel. Since June 14, when IAC Express last reported on the Influenza Vaccination Honor Roll, three additional healthcare organizations have been enrolled. IAC urges qualifying healthcare organizations to apply. IAC recently posted Amharic, Dari, Kinyarwanda, Kiswahili, Nepali, Oromo, and Tigrinya translations of the Haemophilus influenzae type b (Hib) VIS. IAC thanks the Minnesota Department of Health for these translations. IAC recently posted Amharic, Kinyarwanda, Kiswahili, and Tigrinya translations of the Tdap VIS. IAC thanks the Minnesota Department of Health for these translations. IAC recently posted Amharic, Karen, Nepali, and Oromo translations of the Pneumococcal Conjugate Vaccine (PCV13) VIS. IAC thanks the Minnesota Department of Health for these translations. IAC recently posted an updated Nepali translation, and new Oromo translation, of the Polio (IPV) VIS. IAC thanks the Minnesota Department of Health for these translations. A new app of The Vaccine Handbook is now available from the Immunization Action Coalition. The free app, which is available for Apple iPhones and iPads only, contains the complete 2017 (6th) edition of The Vaccine Handbook (“The Purple Book”), by Dr. Gary Marshall, professor of pediatrics and chief of the Division of Pediatric Infectious Diseases at the University of Louisville. The app is fully searchable, with functionality that includes bookmarking, highlighting, user annotation, and links to important vaccination resources. "The Purple Book" is a comprehensive source of vaccine information, drawing together vaccine science, guidance, and practice into a user-friendly resource for the private office, public health clinic, academic medical center, classroom, and hospital. The first section provides background on vaccine immunology, development, infrastructure, policy, standards, implementation, special circumstances, and—perhaps most importantly—addressing concerns. The second section contains details about every vaccine currently licensed in the U.S., including the burden and epidemiology of the respective disease, history of the immunization program, vaccine constituents, efficacy, safety, and recommendations. Print copies of the book ($34.95 each; bulk discounts are available from the publisher) can be ordered from the Immunization Action Coalition website at www.immunize.org/vaccine-handbook. IAC's laminated versions of the 2017 U.S. child/teen immunization schedule and the 2017 U.S. adult immunization schedule are covered with a tough, washable coating; they will stand up to a year's worth of use in every area of your healthcare setting where immunizations are given. Both schedules are eight pages (i.e., four double-sided pages) and are folded to measure 8.5" x 11". CDC recently released the July issue of its monthly newsletter Immunization Works and posted it on the website of the National Center for Immunization and Respiratory Diseases (NCIRD). The newsletter offers the immunization community information about current topics. The information is in the public domain and can be reproduced and circulated widely. On July 24, JAMA Pediatrics published an article titled Public Health and Economic Consequences of Vaccine Hesitancy for Measles in the United States. The "Key Points" and "Conclusions and Relevance" sections from the abstract are reprinted below. How does vaccine hesitancy affect annual measles cases and economic costs in the United States? In this modeling study of children (age 2–11 years), a 5% reduction in measles, mumps, and rubella vaccination coverage resulted in a 3-fold increase in annual measles cases with an additional US$2.1 million in public sector costs. Even small declines in vaccination coverage in children owing to vaccine hesitancy may have substantial public health and economic consequences that will be larger when considering unvaccinated infants, adolescents, and adults. Access the complete article: Public Health and Economic Consequences of Vaccine Hesitancy for Measles in the United States. ScienceBlogs: Surprise! Relatively small decreases in vaccine uptake can lead to big increases in vaccine-preventable disease! CDC is presenting a 15-part webinar series to provide a chapter-by-chapter overview of the 13th edition of Epidemiology and Prevention of Vaccine-Preventable Diseases (also known as "The Pink Book"). This is a live series of weekly 1-hour webinars that started June 14 and will run through October 11. Recordings of sessions will be available online within 2 weeks after each webinar. All sessions begin at 12:00 p.m. (ET). Continuing education will be available for each event. The webinar series will provide an overview of vaccines and the diseases they prevent, general recommendations for vaccines, vaccination principles, and immunization strategies for providers. You can also order this resource from the Public Health Foundation for $40 plus shipping and handling. This print version does not include the 2017 supplement. Save the date for August 30 VICNetwork webinar, "Communication Strategies and Recommendations for the Upcoming 2017–18 Flu Season"
The Virtual Immunization Communication Network (VICNetwork) is sponsoring a one-hour webinar on August 30 at 2:00 p.m. (ET). The webinar will review the 2016–17 influenza season and summarize the 2017–18 ACIP influenza vaccine recommendations. The VICNetwork is a partnership between the National Public Health Information Coalition and the California Immunization Coalition. On July 28, ACIP posted the minutes from the Advisory Committee on Immunization Practices (ACIP) meeting held on February 22–23. Presentation slides and archived video broadcast footage from the meeting were made available earlier. ACIP will hold its next meeting on October 25–26 in Atlanta. To attend the meeting, ACIP attendees (participants and visitors) must register online. The registration deadline for non-U.S. citizens is September 25; for U.S. citizens, it's October 5. Registration is not required to watch the meeting via webcast or listen to the proceedings via phone. How long can reconstituted MMR vaccine be stored in a refrigerator before it must be discarded? The amount of time in which a dose of vaccine must be used after reconstitution varies by vaccine and is usually outlined somewhere in the vaccine’s package insert. MMR must be used within 8 hours of reconstitution. MMRV must be used within 30 minutes; other vaccines must be used immediately. The Immunization Action Coalition has a staff education piece that outlines the time allowed between reconstitution and use, as stated in the package inserts for a number of vaccines. Handout can be found at the following link: www.immunize.org/catg.d/p3040.pdf.